Install the actuator with bracket with the 3 nuts. 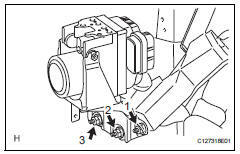 The nuts should be tightened in order from 1 to 3 as shown in the illustration. 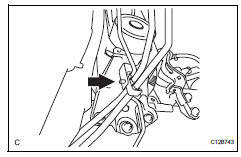 Connect the brake tube clamp to the bracket. 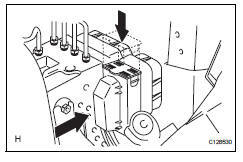 Connect the connector and push the lock lever downward. 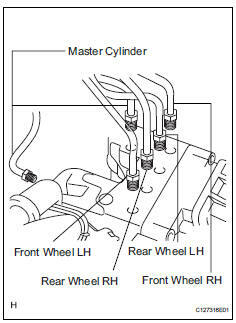 Using sst, connect the 6 brake lines to the correct locations on the actuator, as shown in the illustration. Check the abs and traction actuator with the intelligent tester (see page bc-180).